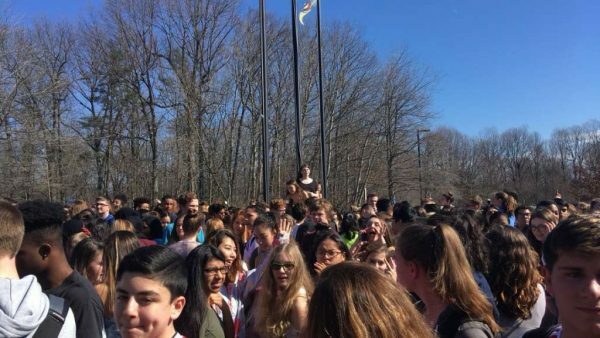 Roughly 350 students at South Lakes High School took part in a walkout at noon today to remember the 17 people killed last week at Marjory Stoneman Douglas High School in Parkland, Florida. Students left the school and stood outside for 17 minutes before returning for class or lunch, school officials said. A similar walkout happened at Langston Hughes Middle School today. Around 250 students participated in that event. “I am proud of how the students conducted themselves, including a moment of silence that was very moving,” said SLHS Principal Kim Retzer in a statement. Our teachers, administrators and staff continue to reinforce a sense of positive school community and we ask for your partnership in working with your child to discuss meaningful actions that they can take to engage in their community. Another walkout is planned for National School Walkout Day on March 14. Schools across the country are expected to walk out to demand action on gun violence and school shootings.